Venu Gaanam is a traditional South Indian flute concert lead by Shantala Subramanyam a renowned flute artist and vocalist. 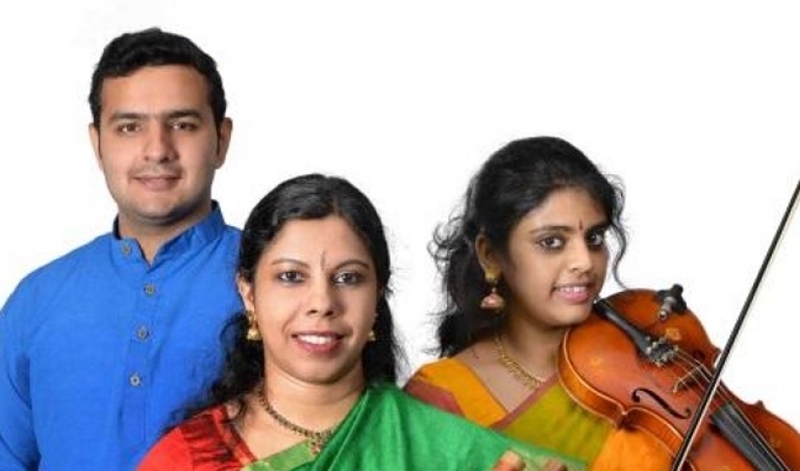 She will be accompanied by a talented violinist and vocalist Shradha and on the Mridangam by an young star Anirudh. The team presents instrumental music comprising of improvisations in Ragas, Krithis in South Indian languages and Kunakkol [vocal percussion language]. Most part of the concert dwells on Aalapana [melodic improvisation], Swara kalpana [a dialogue between music and rhythms] interspersed by Krithis. The central piece of the concert will include a percussion solo. Shantala, born in Bangalore – India, was immersed in music right from her birth having born into an illustrious music family. She was initiated into formal training in Carnatic Classical vocal music at the age of 4 and she took to flute playing when she was about 11 years old. She was trained by her father Subramanyam and other eminent performers. Shantala has toured widely in India and abroad and graced many prestigious stages and festivals. She is known for her melodic presentations combined with complex rhythmic patterns. She has released four albums in collaboration with popular and competitive artists from the South Indian music tradition. Shradha Ravindran, a violinist, is a disciple of Sangeetha Kalanidhi A. Kanyakumari. Currently graded A by the All India Radio, she has been featured in many music albums. She has travelled extensively in India providing violin accompaniment to many reputed artists. Shradha has been featured in many violin ensembles lead by her Guru. Anirudh, a Mridangam artist, started training at 12 under M. V. Mohan and later under K. U. Jayachandra Rao. He has performed alongside many famous musicians across prestigious venues in India. Anirudh is a recipient of many awards and accolades and has travelled widely. About Organizer The Nehru Centre (TNC) acts as the cultural wing of The High Commission of India in UK. Established in 1992, it is regarded by ICCR as its flagship cultural centre abroad, and has, over the years, emerged as a premier institution engaged in India’s cultural interface with UK. The Centre organises a wide range of cultural events on its premises, showcasing Indian music, dance and theatre, besides a range of activities aimed at strengthening and deepening the intellectual dialogue between the two countries, including exhibitions, lectures, illustrated talks, book launches, film screenings, workshops, seminars and round tables. The Centre serves as a platform for Indian culture in the broadest sense, focussing on the role played both by British and Indian artists in promoting greater mutual cultural understanding. It has launched several books by both Indian and British authors and promoted the participation of British authors in Indian literary festivals. The Centre also serves as a catalyst and facilitator in promoting interaction among cultural bodies in the two countries, as well as in building strategic partnership and collaborations with important cultural institutions in UK with the end objective of promoting Indian culture in this country.